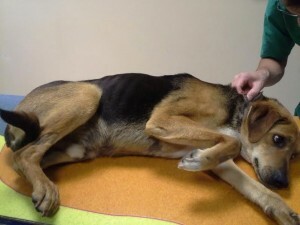 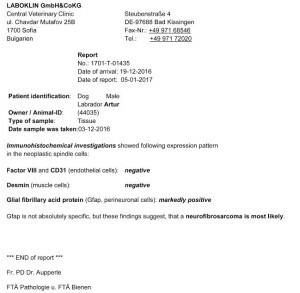 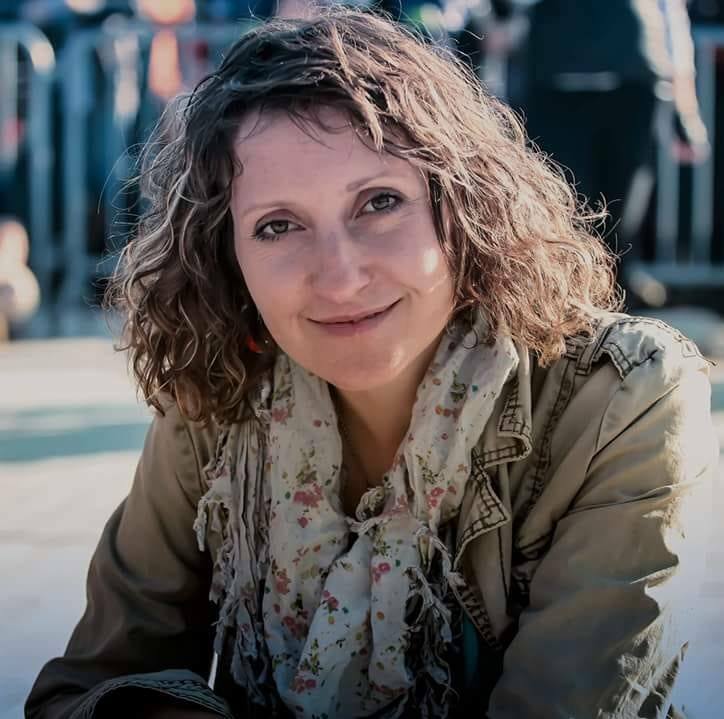 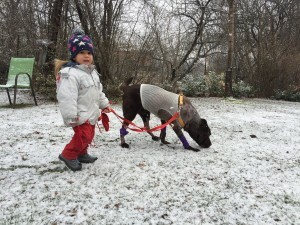 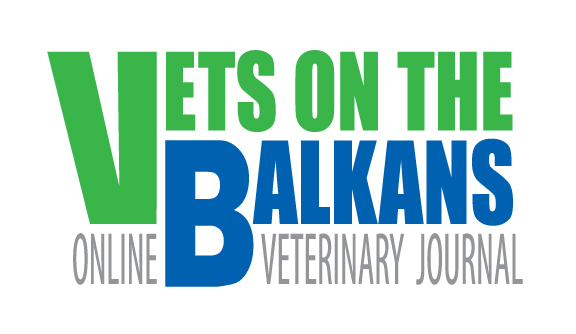 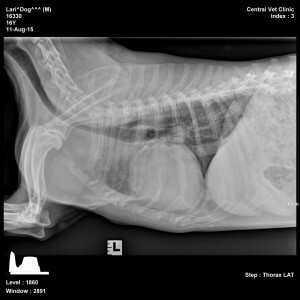 An “exotic” diagnosis for Bulgaria just 5 years ago, Heartworm Disease (HWD) is a parasitic infestation that we nowadays see regularly in our small animal practice. 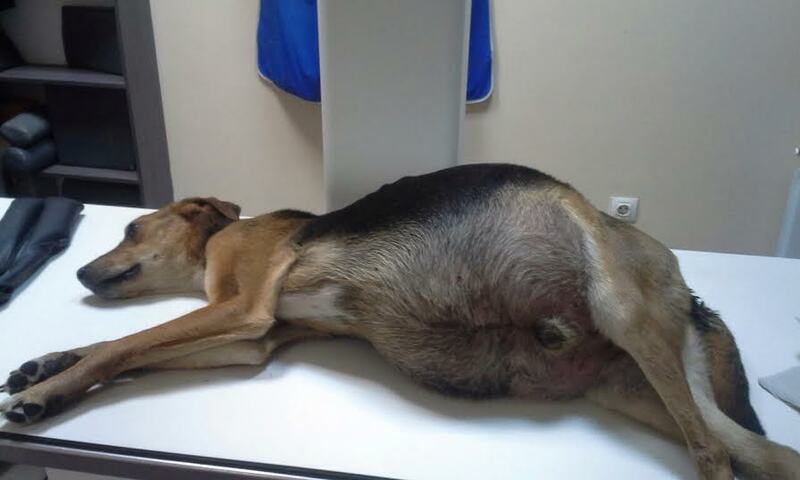 Due to climate change and spreading of intermediate vectors, ever more dogs are getting affected. 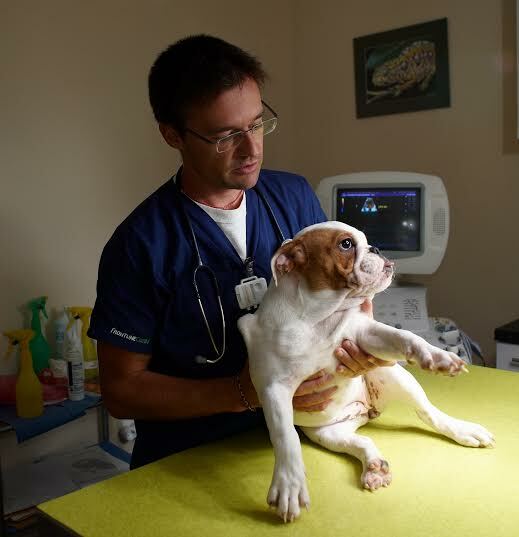 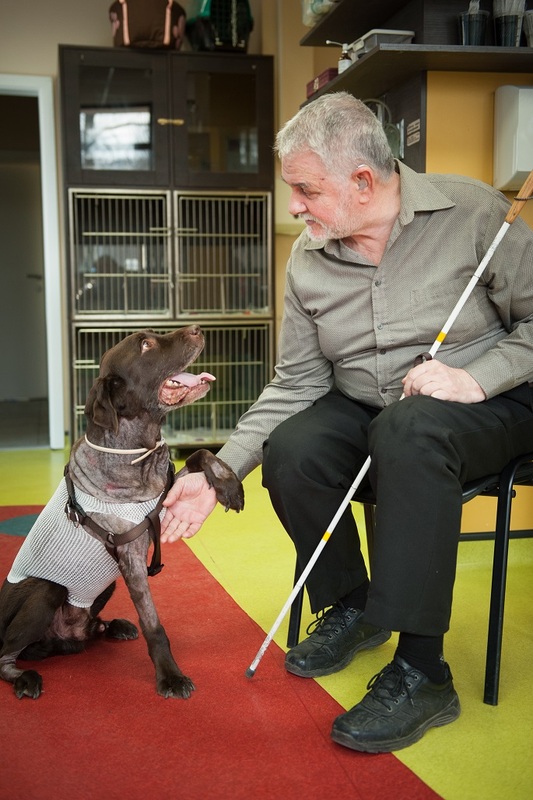 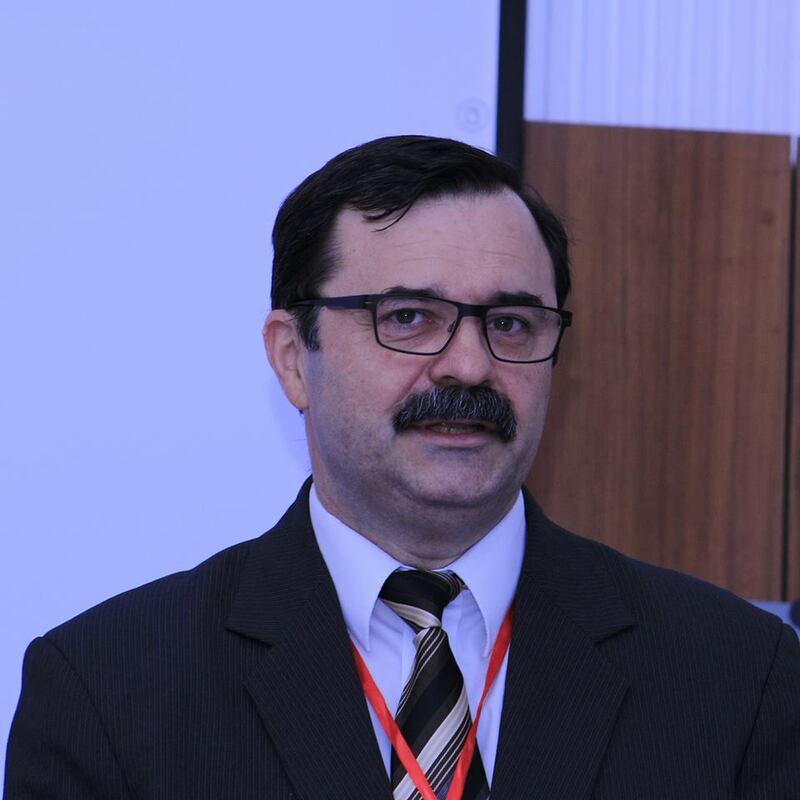 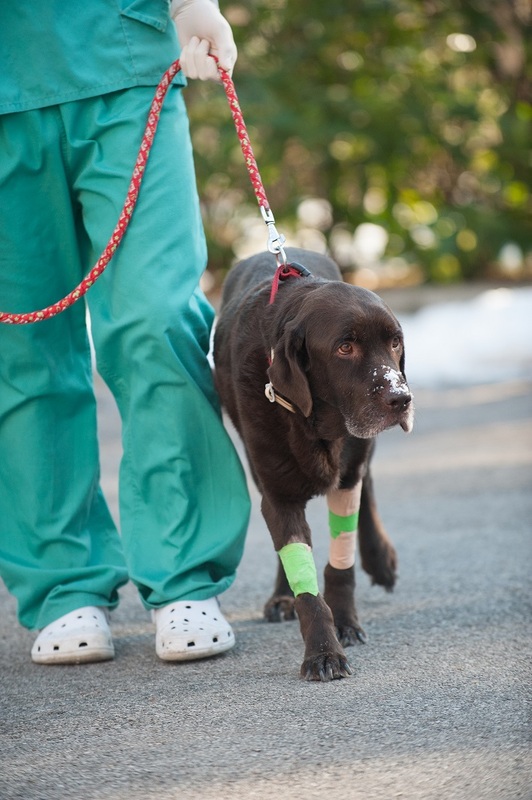 Other major contributing factors are the infrequency of preventive measures in the country and the high number of undiagnosed and subclinical patients, leading to a reservoir of hosts in the general canine population. 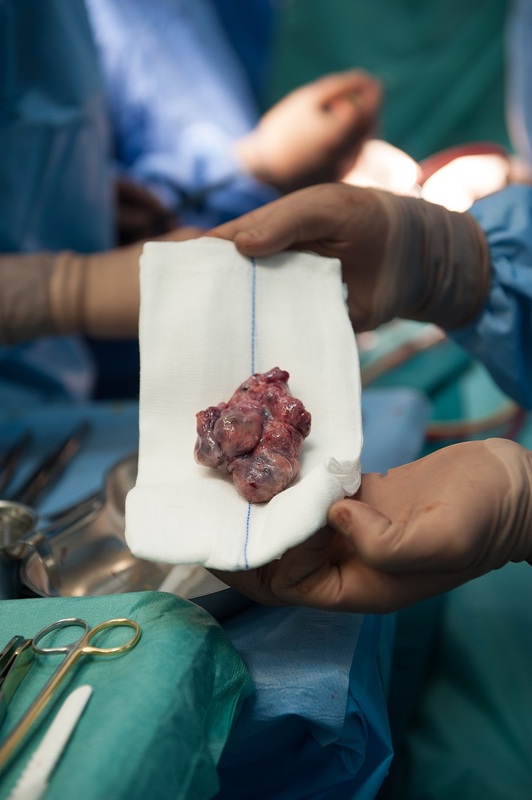 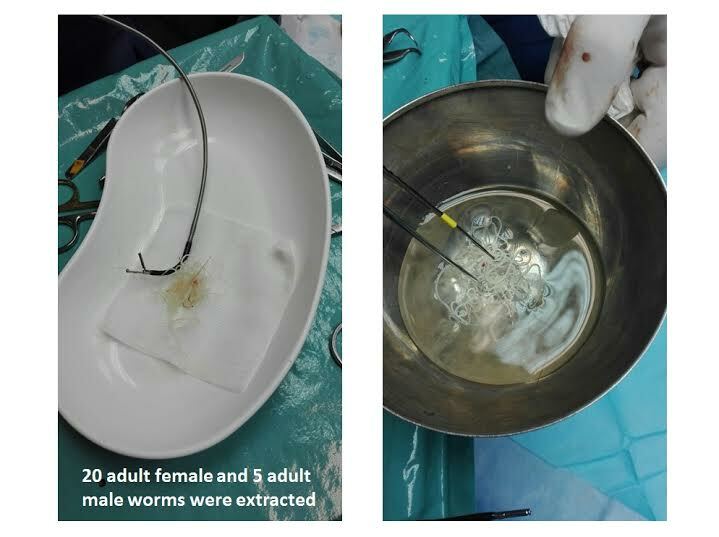 The aim of this article is to report a case where the heavy worm burden of the patient warranted surgical extraction prior to adulticide therapy. 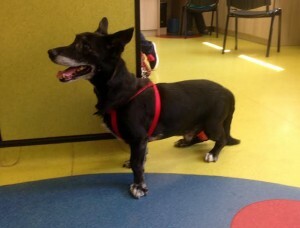 Rem is a 25kg, 10 years old MC mix breed dog admitted because of ascites and exercise intolerance during the past few weeks. 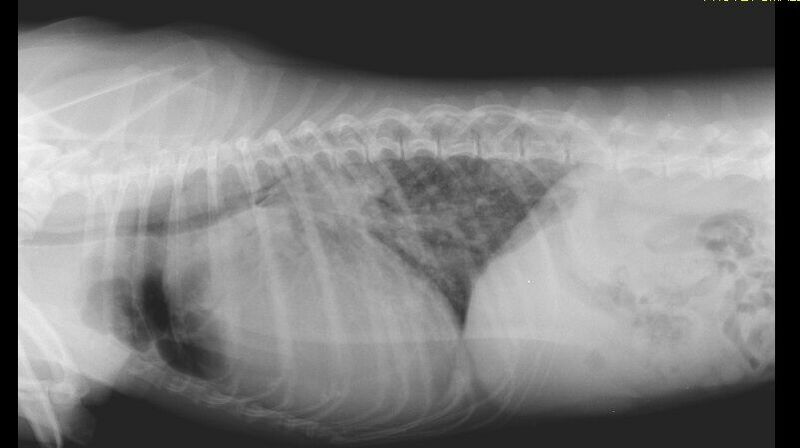 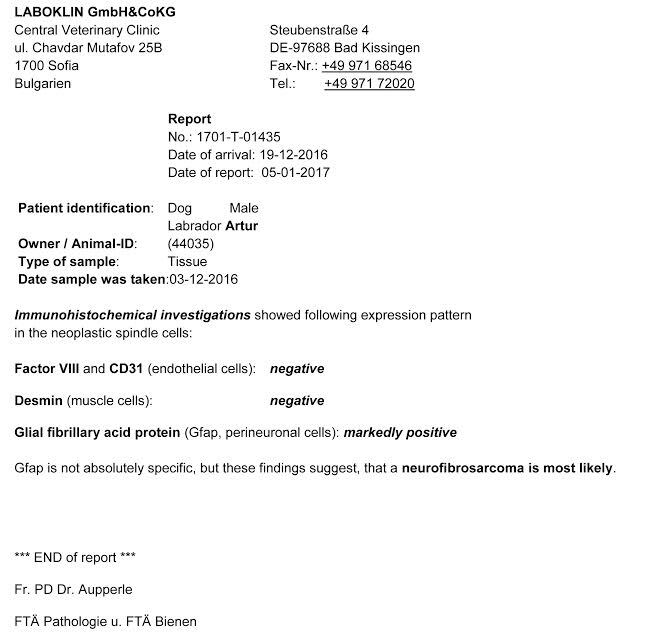 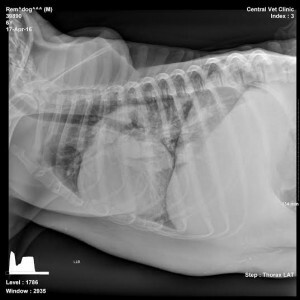 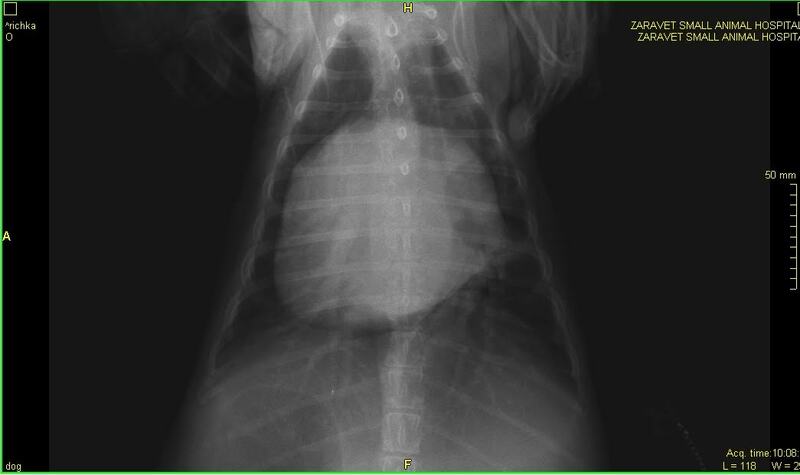 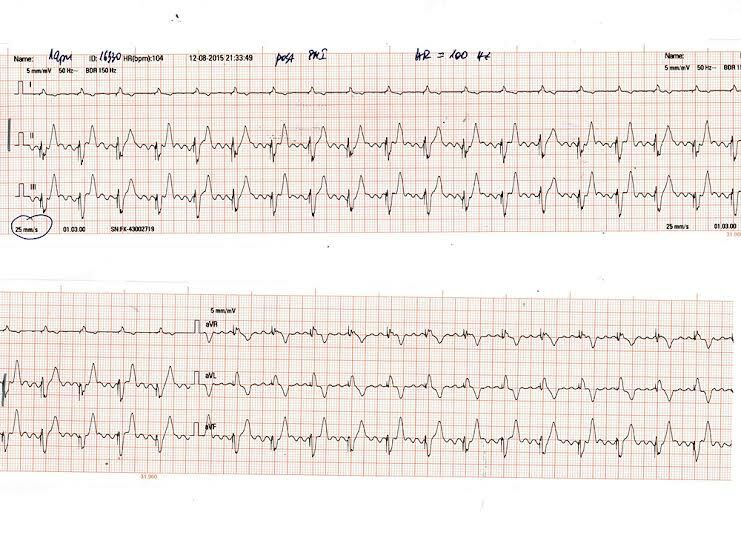 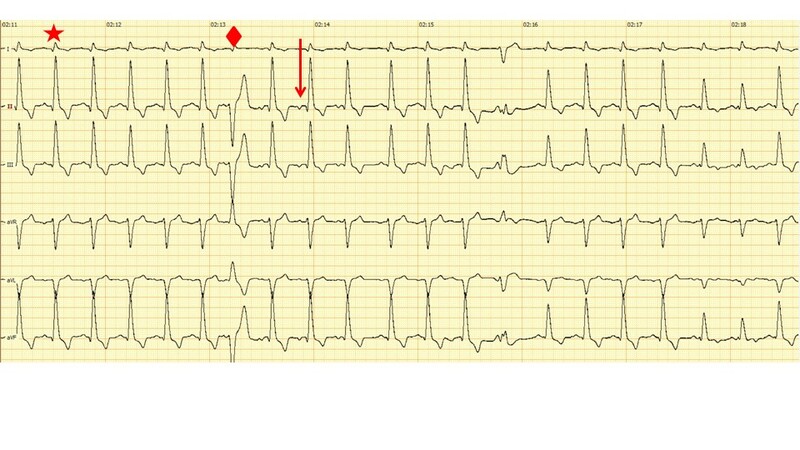 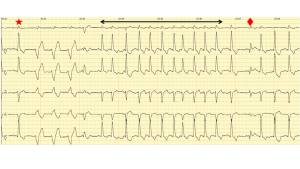 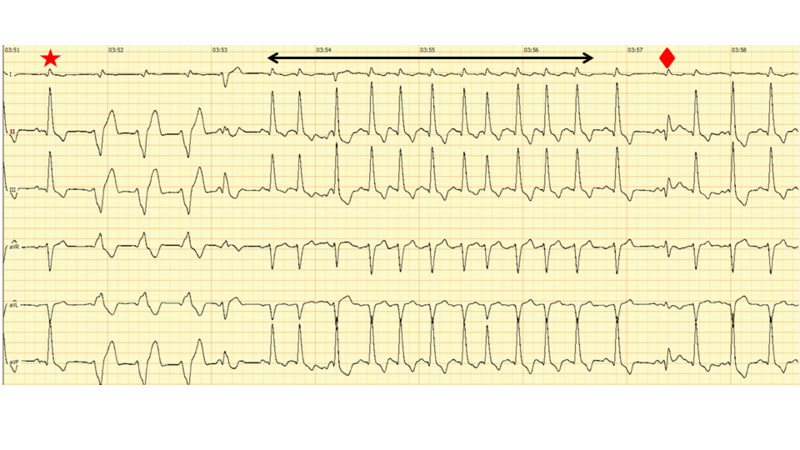 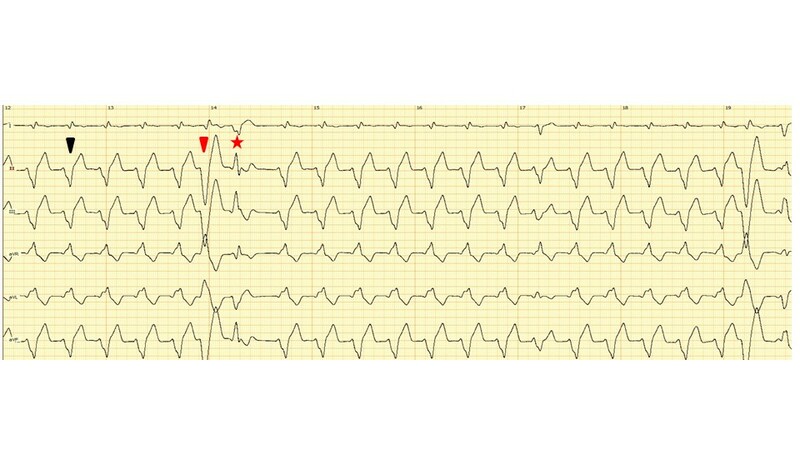 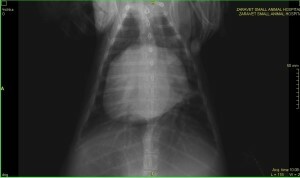 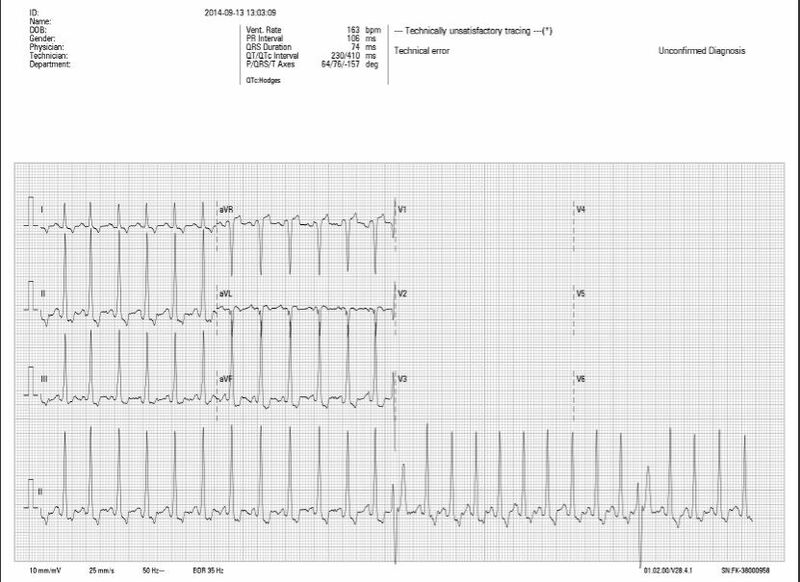 Most prominent of the clinical signs was the severely distended, fluid-filled abdomen – assessed as modified transudate on abdominocenthesis (more than 4 liters were drained because of the labored breathing). 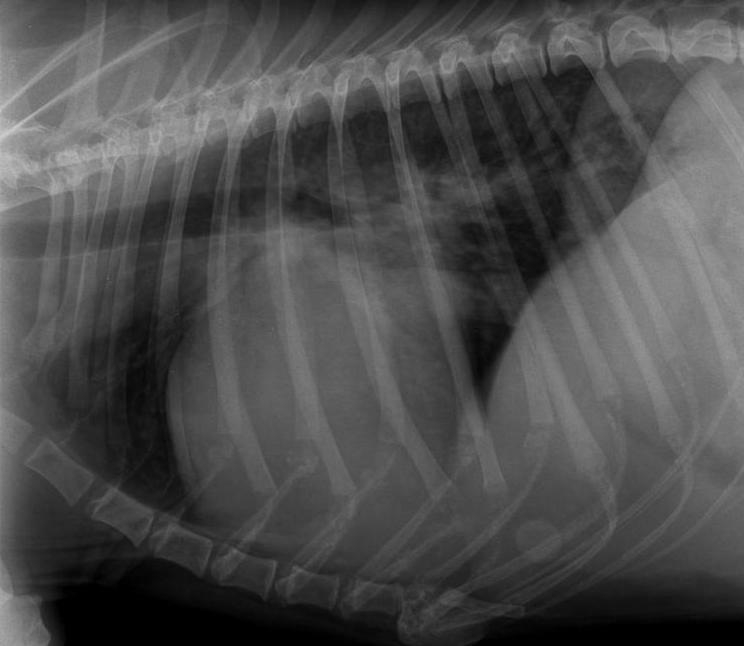 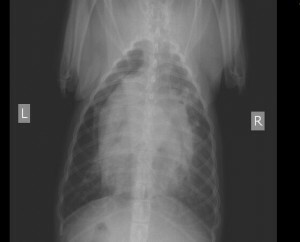 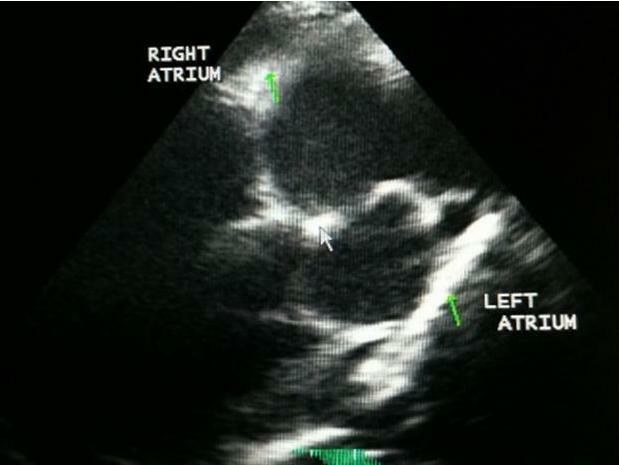 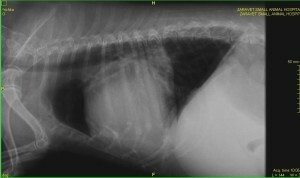 Thoracic X-rays revealed right-sided cardiomegaly and severely distended tortuous and blunt-ended pulmonary arteries. 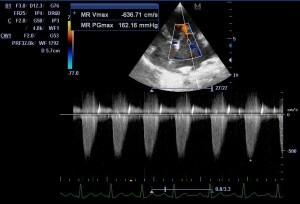 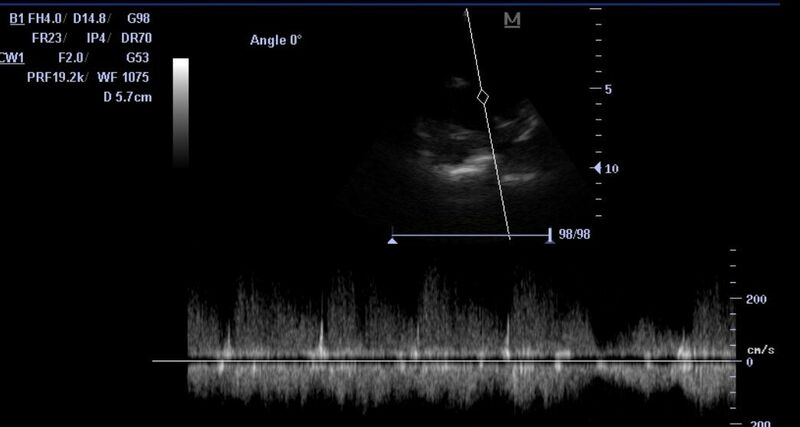 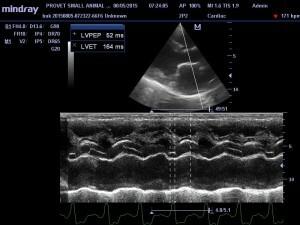 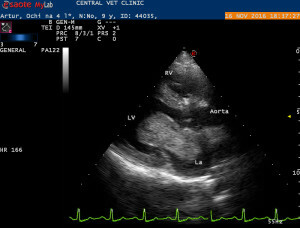 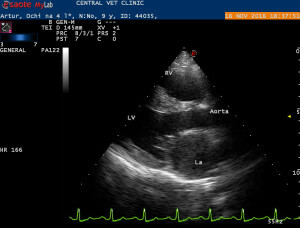 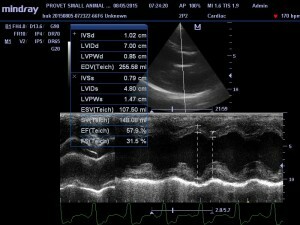 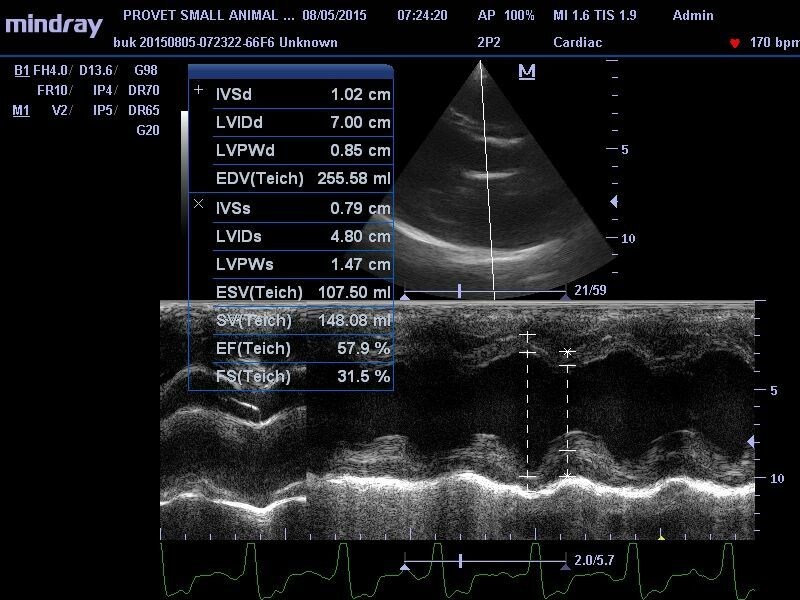 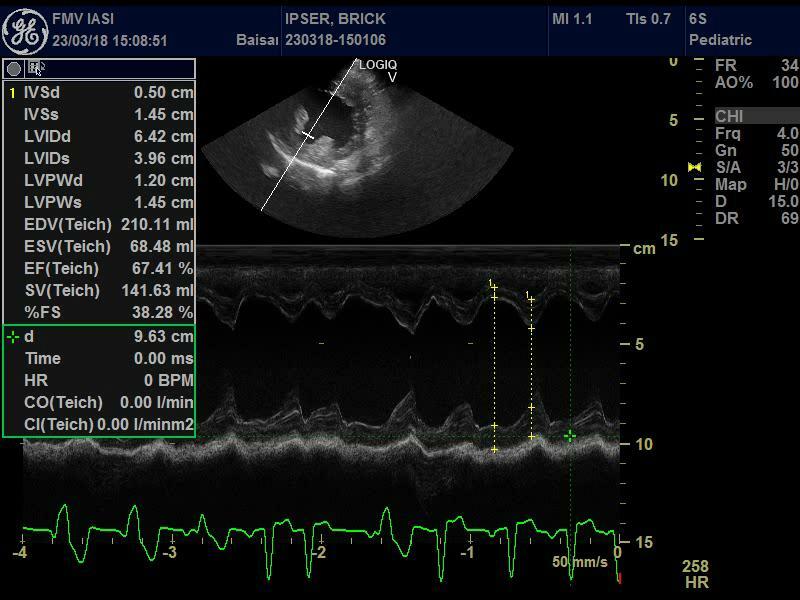 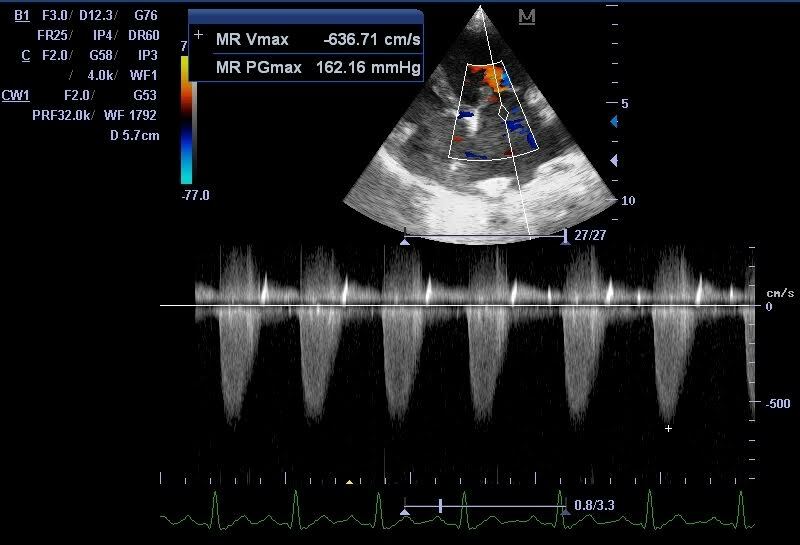 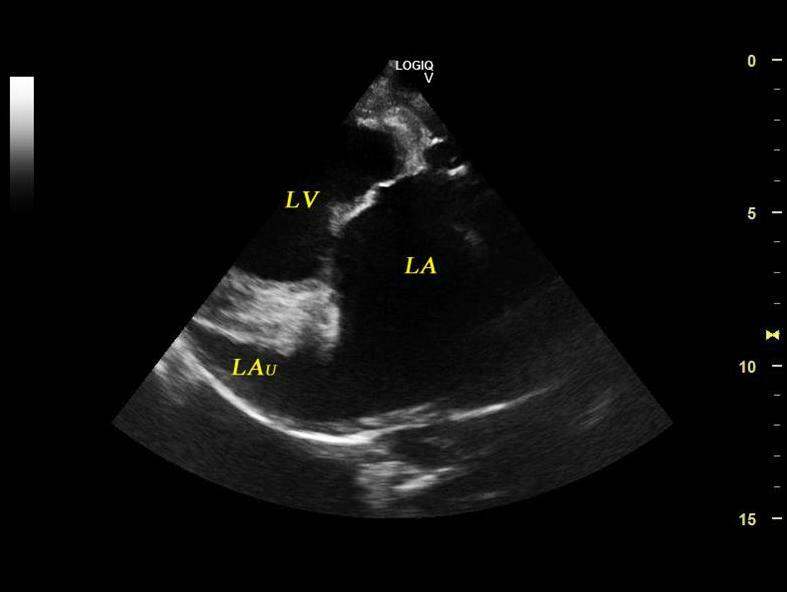 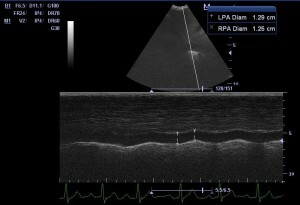 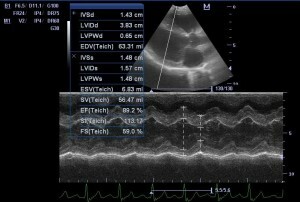 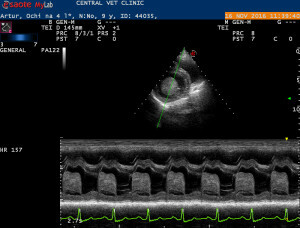 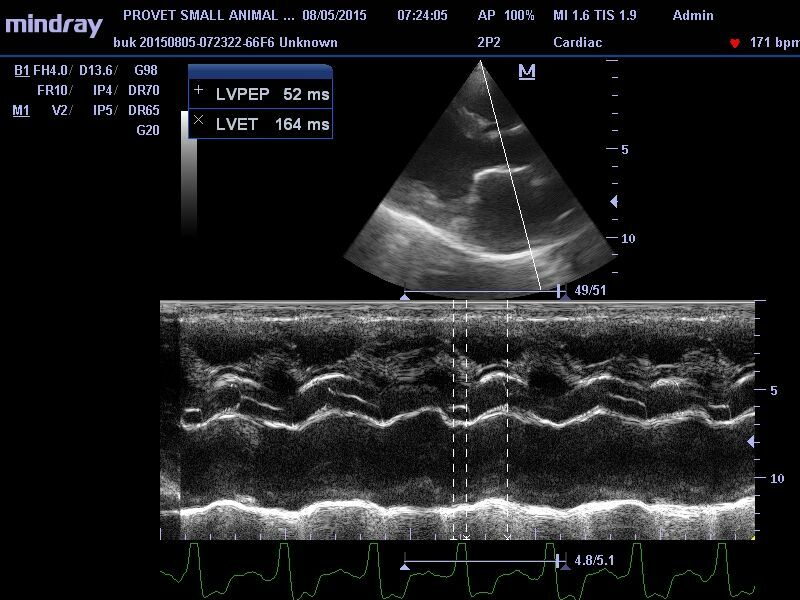 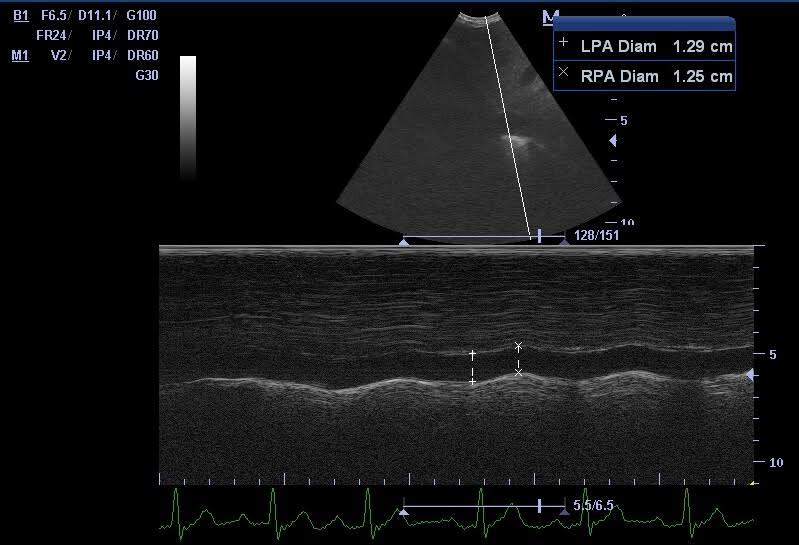 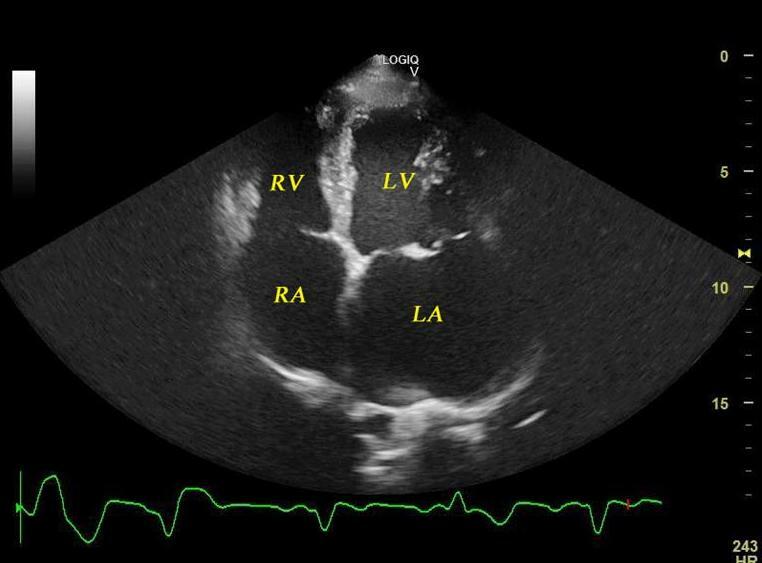 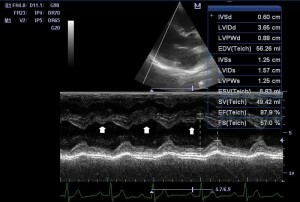 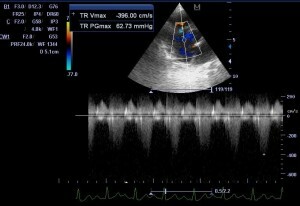 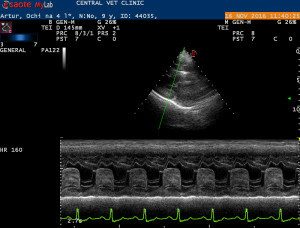 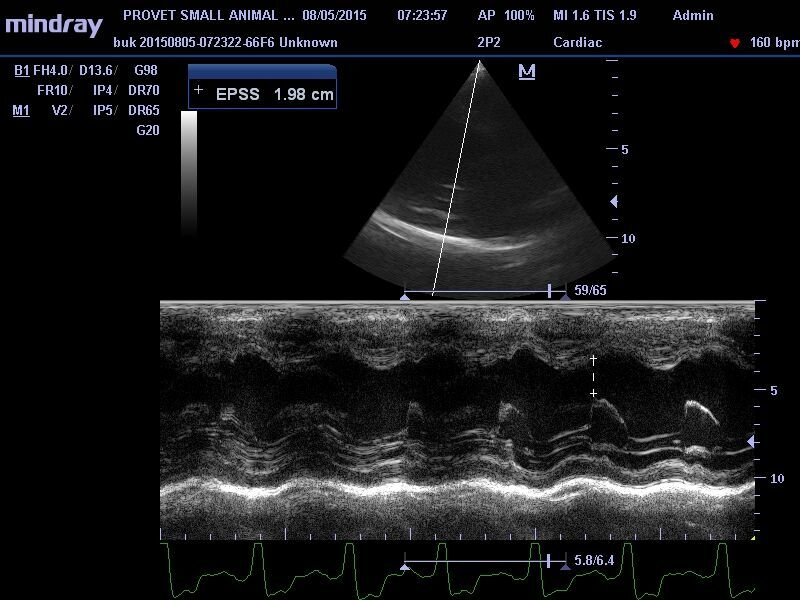 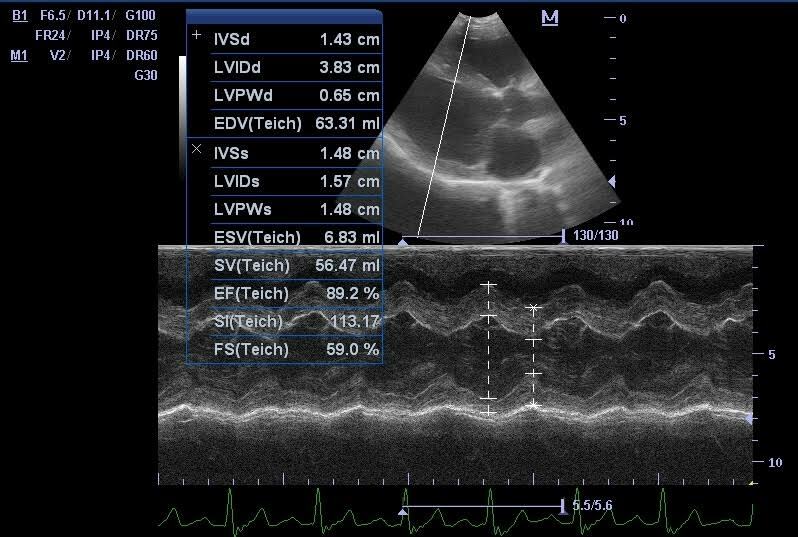 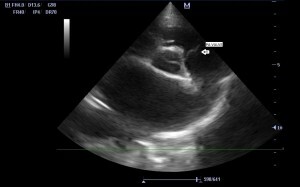 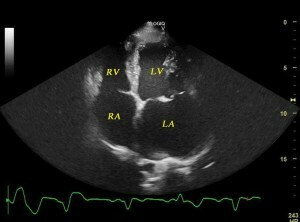 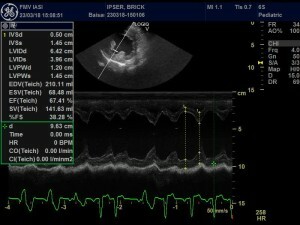 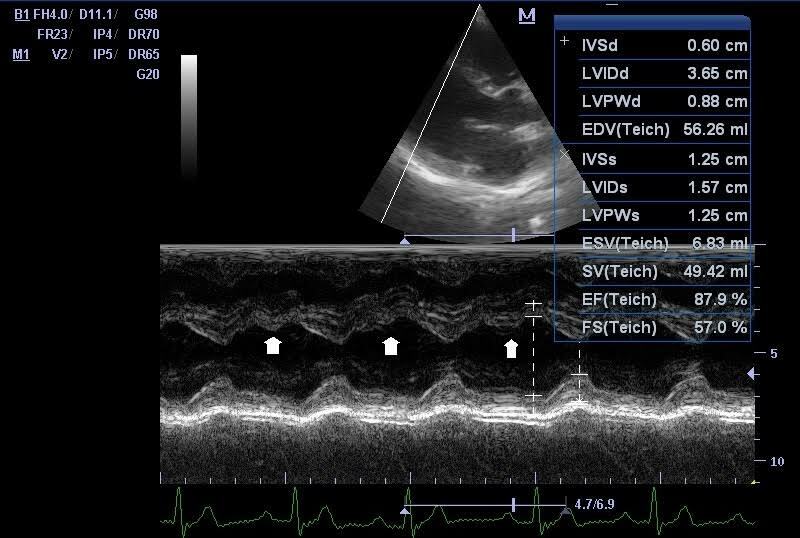 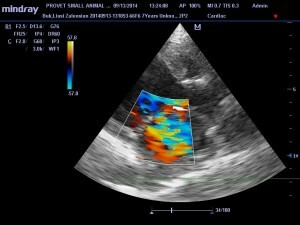 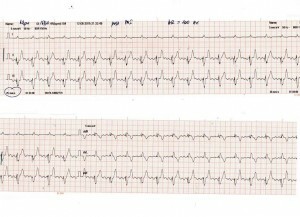 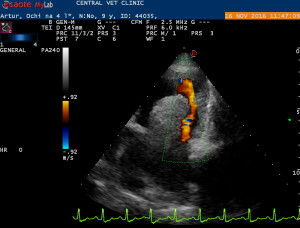 On echocardiography, right heart pathology was mainly observed – including a distended right atrium and ventricle, dilated pulmonary artery and evidence of pulmonary hypertension, as well as many tubular echoic structures in the lumen of the main pulmonary artery, typically identified as adult parasites. 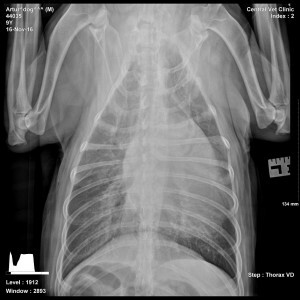 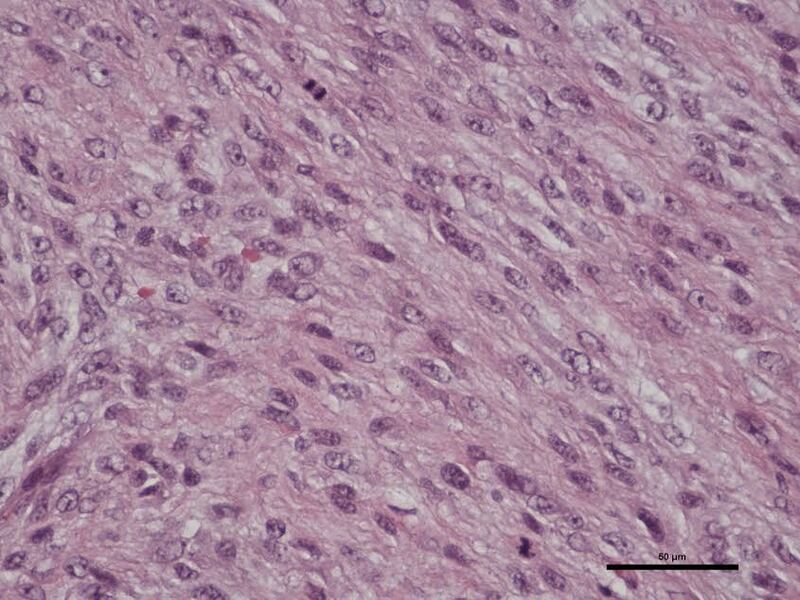 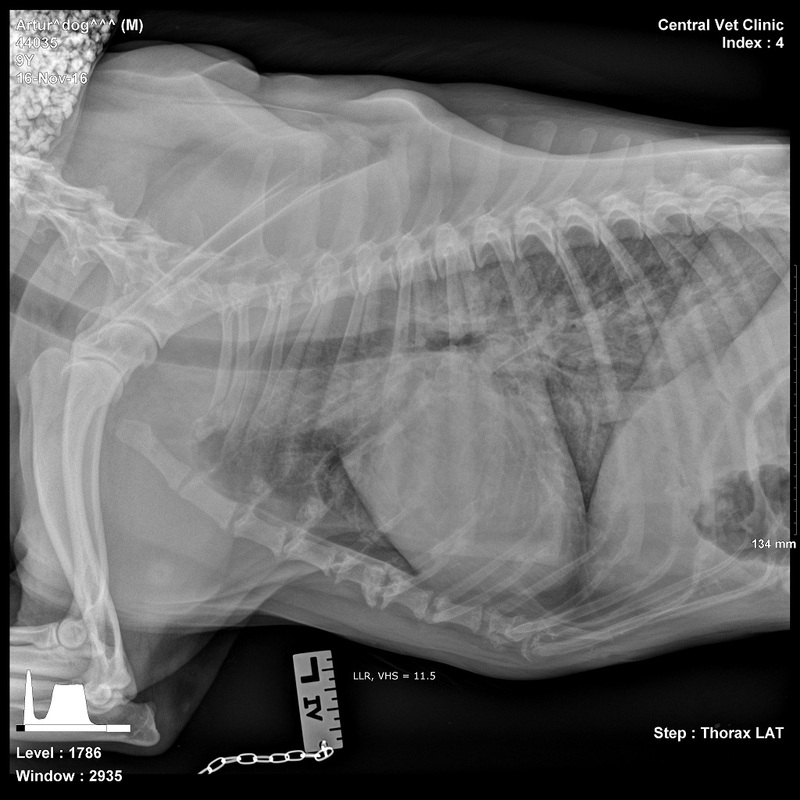 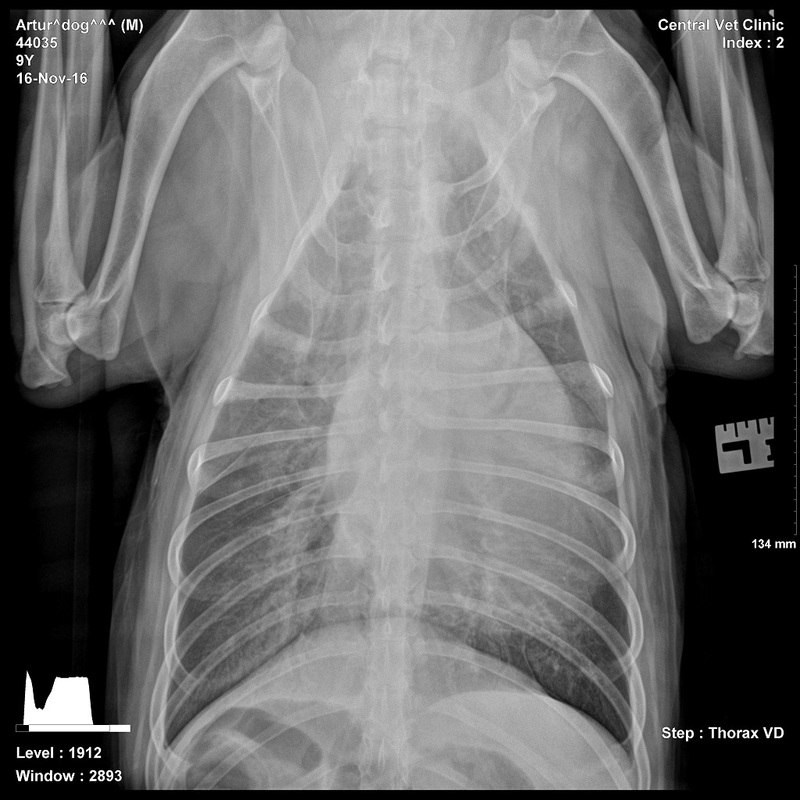 Serology was positive for D. immitis (IDEXX 4D snap test) and the dog was classified as stage III HWD. 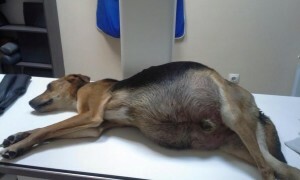 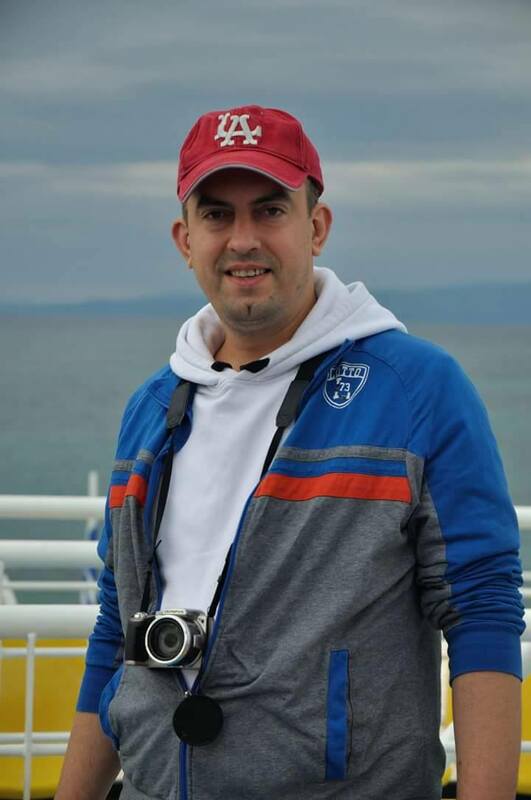 Because of the high worm burden and ascites, the possibility of interventional removal of the worms, before the adulticide treatment, was suggested to the owner, who gave his informed consent. 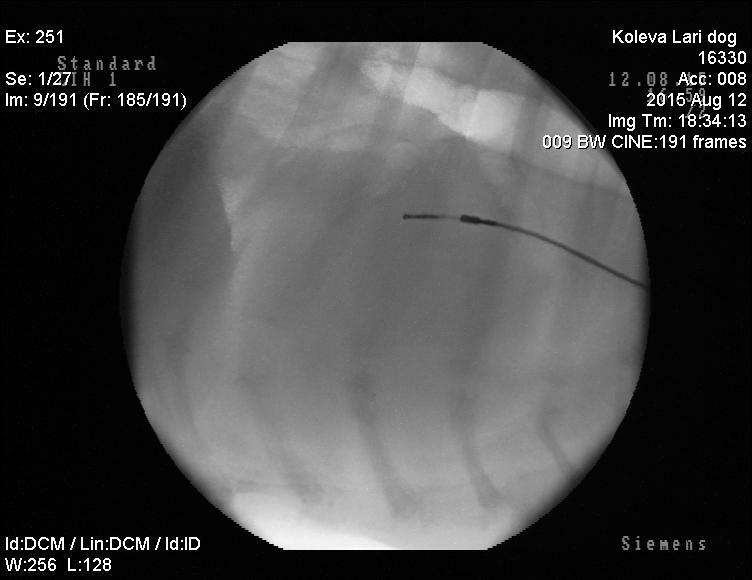 Surgical extraction of worms was routinely performed using the right jugular vein approach. 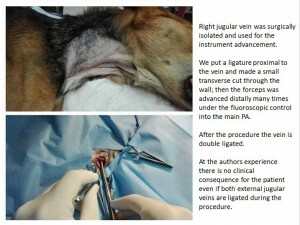 The area was scrubbed aseptically and a small skin incision was made over it. 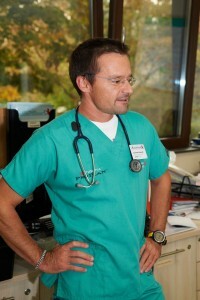 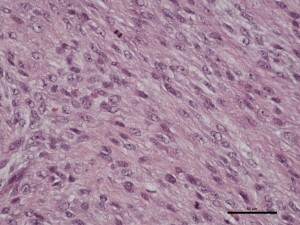 The vein was dissected free from the surrounding tissue and ligated proximally. 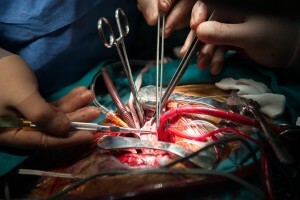 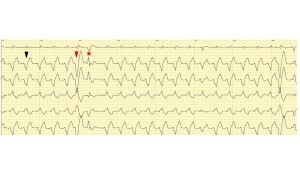 A small transverse cut in its wall was made, through which a forceps was advanced into the heart under fluoroscopic control. An Ishihara Flexible Alligator Forceps (Fujinon TypeL FK-480L) was used, which is a vet instrument designed in Japan, especially for Dirofilaria extraction. 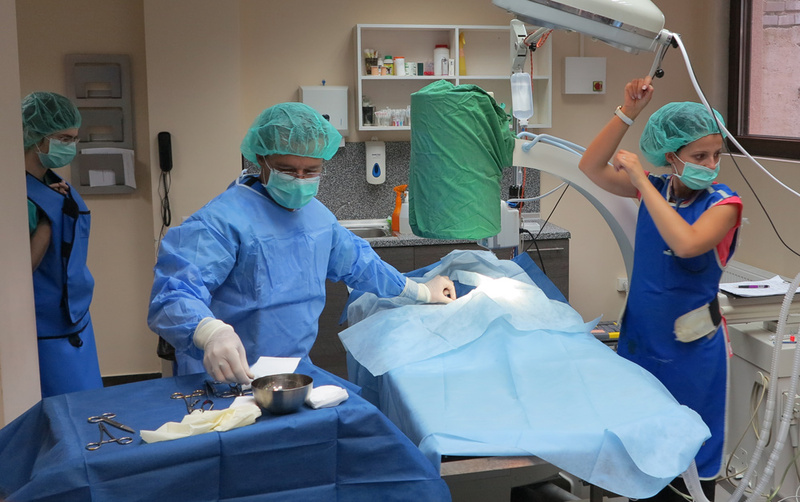 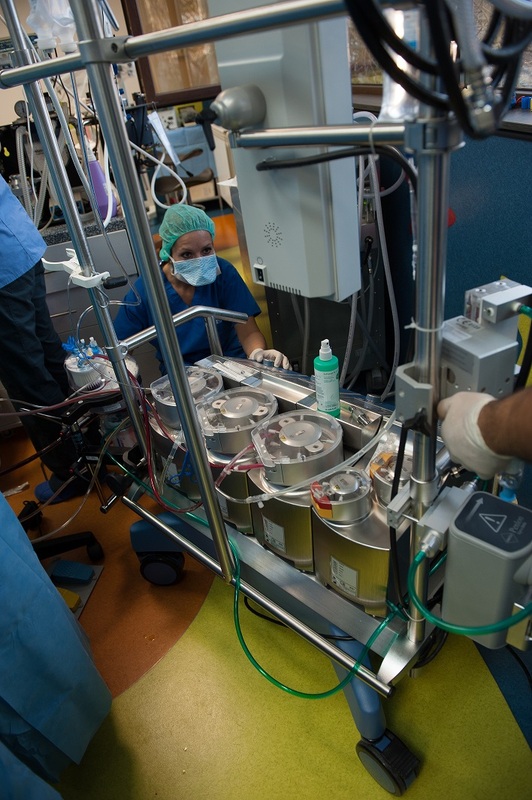 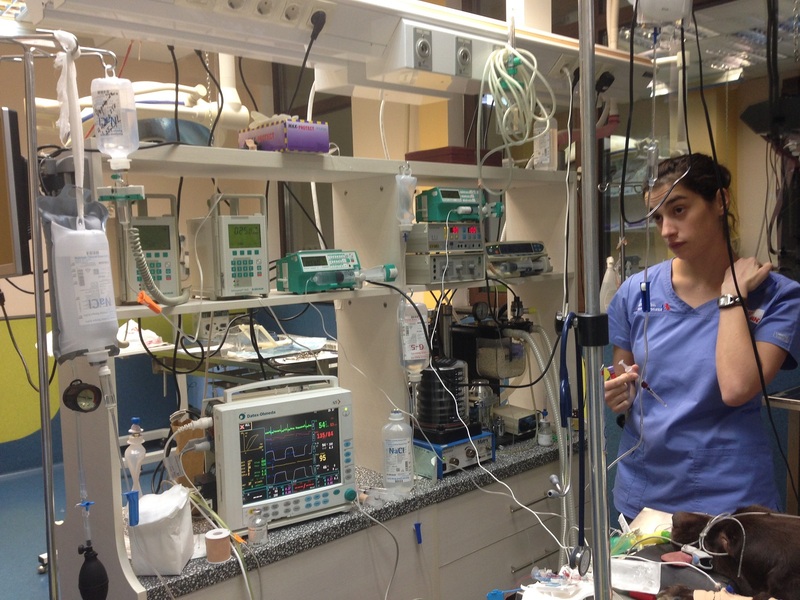 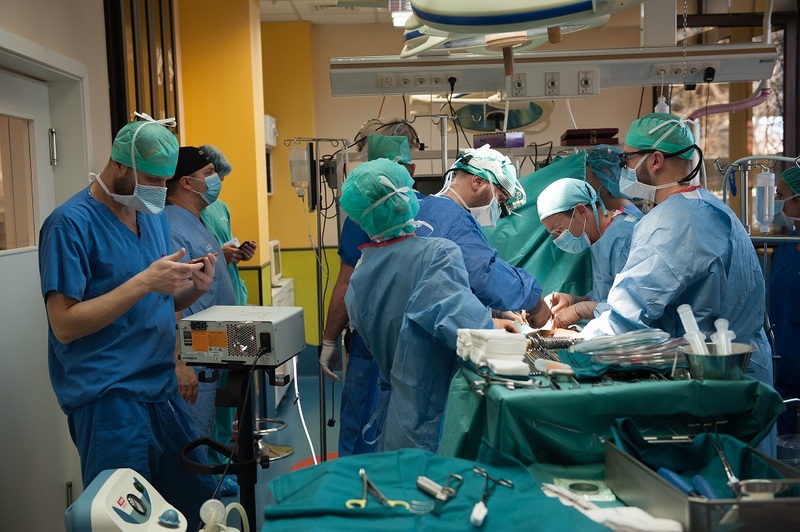 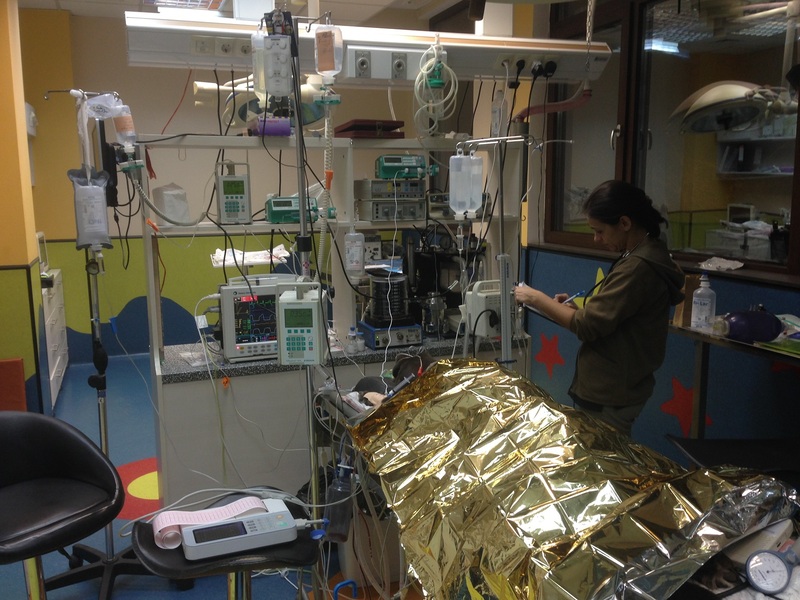 The anesthetic protocol we used was typical for this procedure; in particular premedication with Atropine, Butorphanol and Midazolam; induction with Etomidate; and finally Isoflurane maintenance. 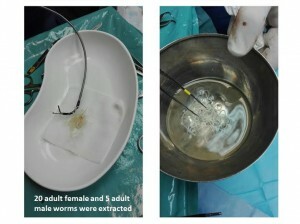 After nearly 20 attempts, we extracted 25 adult worms. The overall fluoroscopic time of the procedure was less than 5 minutes. 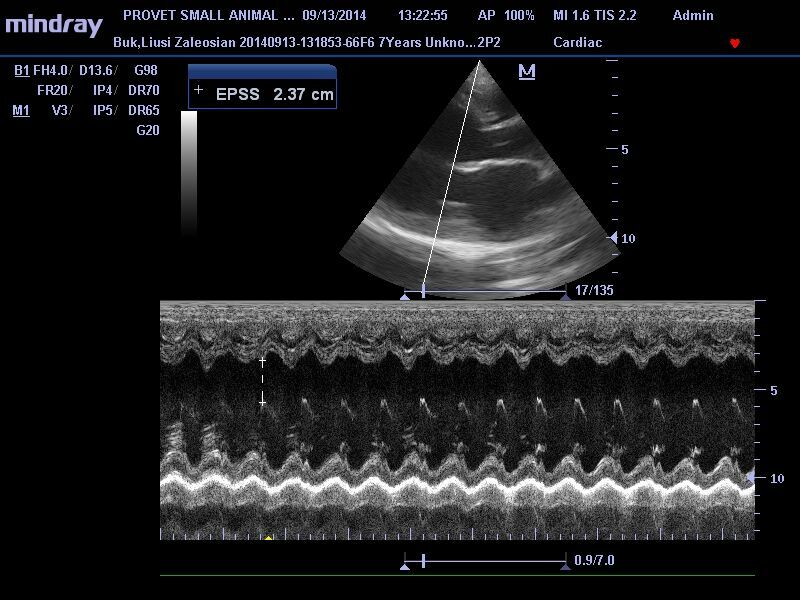 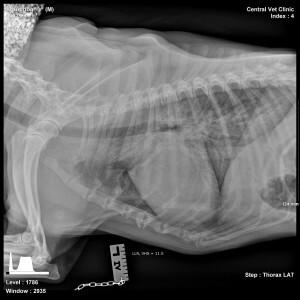 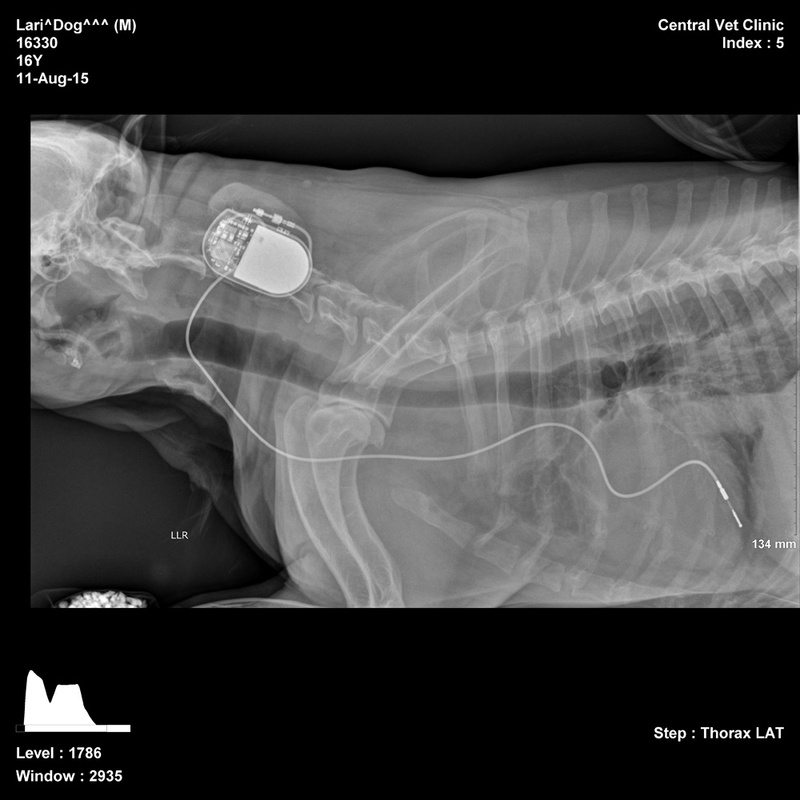 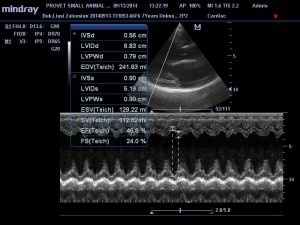 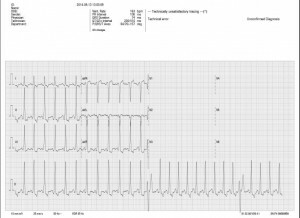 The recovery of the patient was uneventful and a day later we started the adulticide protocol for HWD treatment, as recommended by the American Heart Worm Association. 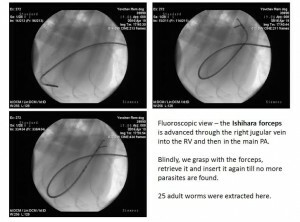 In all cases with stage III or IV HWD it is advisable to discuss the possibility of surgical extraction of some of the worms as a pre-adulticide step. 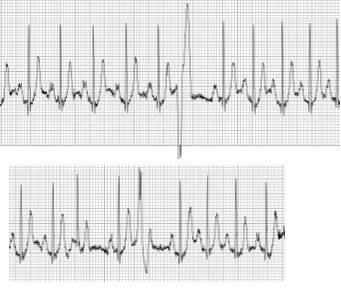 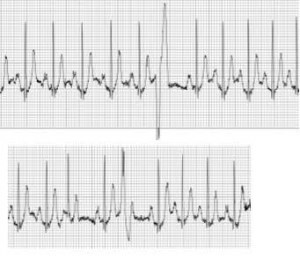 This will lower the risk of fatal pulmonary thromboembolism after the injection of Immiticide and will likely improve the symptoms of existing pulmonary hypertension. 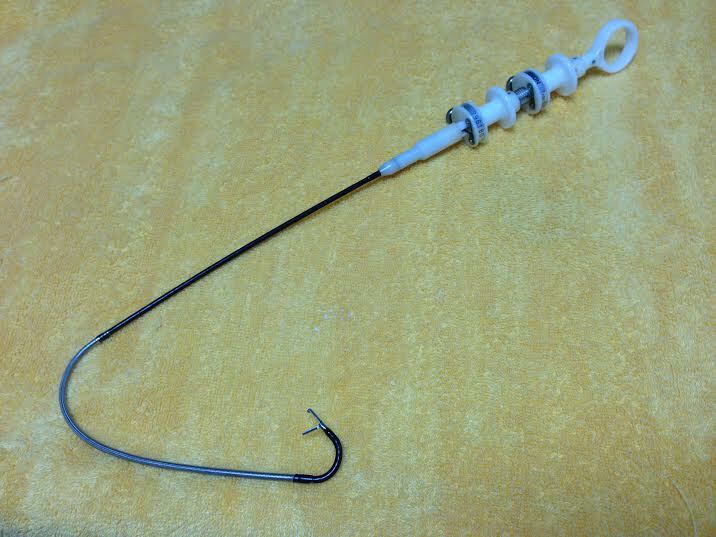 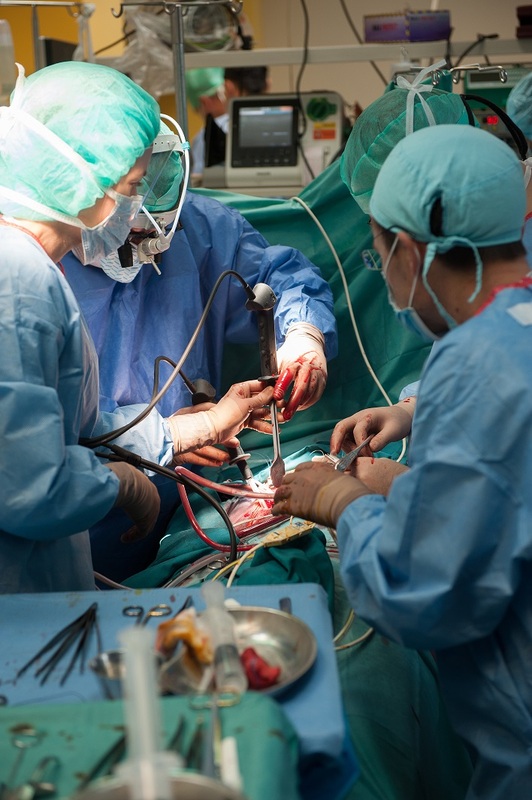 It should be noted that if a different extraction device is used (endoscopic loops and baskets, rigid or semi-rigid alligator forceps, different types of graspers, etc. 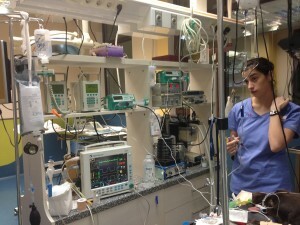 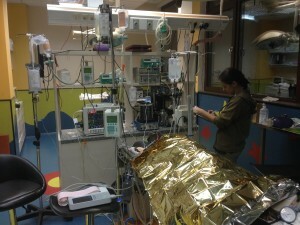 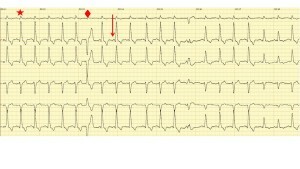 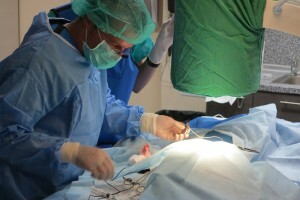 ), the success rate of the procedure is much lower, at least in our experience. 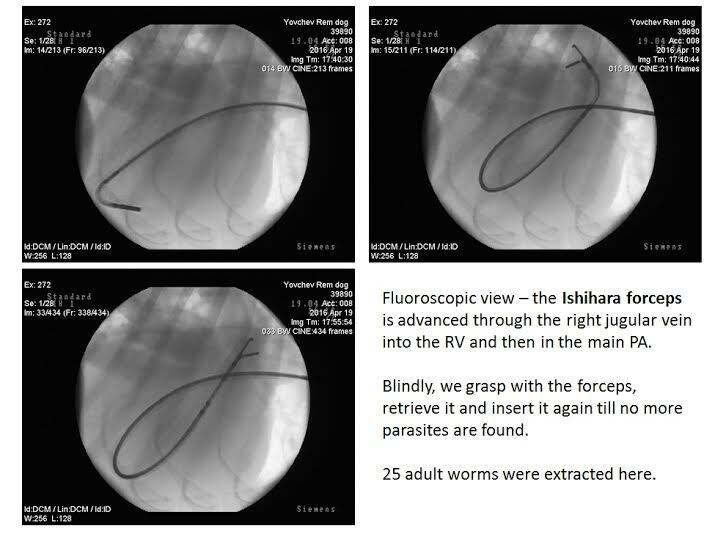 The Ishihara forceps could be actively maneuvered into the RVOT, hence providing faster and easier access to the PA.
Surgical extraction of a heavy worm burden is possible and clinically important before adulticide treatment, in patients with end-stage HWD. Rem, the dog of our study, successfully completed the treatment protocol for HWD without any evidence of pulmonary thromboembolism; meanwhile the symptoms of RCHF have slowly abated.